As they wind up the final days of the tour, some people might think that the team has already started to throw in the towel… NOT A CHANCE! The Tater Team just mashed up one of the most rewarding weeks yet by visiting a very unique ‘fork’ in the road, having some great run-ins with the Huntington police, and spending a weekend at the 78th Annual Fall Festival in LA. Yep, after a week of being surrounded by the masses and reaching new heights with the media, the Team couldn’t help but relish in the glory at the end of a trip that has certainly changed their lives. We are still loving our tots! The first stop in Pasadena was fit for a feast of epic proportions. The truck was invited to visit an iconic ‘Fork’ in the road that is, well, at a fork in the road. 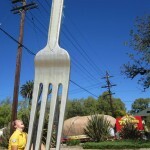 This fork measures in at 18’ feet high and was a birthday present, turned practical joke, turned controversial guerilla art. Only recently, after much support from the local community, was it allowed to stay mounted in its current spot at what is now known as “Fork Plaza”. The team’s arrival came at a very opportune time as the man, the myth, the legend: Phil Coombes; is preparing to launch his annual food drive, “Put a Fork in Hunger”. 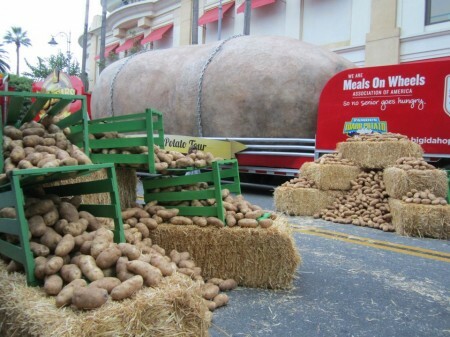 This food drive was able to collect FIVE TONS of food last year (that is one ton less than our giant spud weighs), and this year he aims to shatter this record. And judging by the attention that the two behemoth structures and Phil Coombe’s ever-so-persuasive ways were able to generate, this should not be a problem. 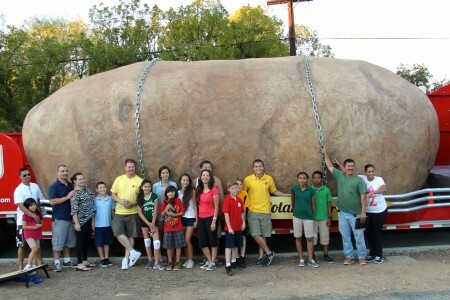 The community of Pasadena welcomed the Big Idaho Potato with open arms and came out all day long to take pictures and show their support. Local media outlets weren’t shy either. The Tater Team actually lost count of how many interviews they did among the three of them (they aren’t very good once they run out of fingers) and the story was picked up by outlets all across the country including the L.A. Times, the Today Show, and the Weather Channel. Yes the SoCal sun was out, the moods were high and the nation was reminded of the power that good will, charitable contributions, and, of course, larger than life sculptures can have in making the world a better place. All week long the team was blessed with beautiful sunshine and warm weather, but it wasn’t until they hit the Huntington Beach area that they were welcomed by a nice cool sea breeze… and red and blue flashing lights. That’s right folks, the Tater Team can add yet another interesting story about their run-ins with the law! The first incident last Thursday came when an officer, rather spontaneously I might add, decided we may be too wide to be driving without a pilot car. So three cruisers, a motorcycle and a CSI (Crime Scene Investigator) later, they had the measuring tape and camera out to verify our width and capture the odd moment at the same time. Meanwhile, the McDonalds patrons and other passersby were having a heyday taking pictures of this peculiar event taking place in Orange County. After what became a short 40 minute event, the Tater Team was able to continue on their way, unscathed I might add, to their destination. But it wouldn’t be the last they heard from Huntington PD. That evening Paul was giving Ellis and Kaiti a ride to Huntington Beach. This time they were flying light (tractor only, no potato). After only 10 minutes of driving, they heard the same thrilling ‘whoop whoop’ that never ceases to uplift the average citizens pulse. What was it this time you ask? Well apparently, despite never having had a problem with this in the past six months, you cannot drive with ‘Oversize Load’ signs when you do not have an oversized load attached. Luckily this was a quick fix but we couldn’t help but smile when the officer walked up to the window and said through a smirk, “This isn’t the first time you guys have been pulled over today is it?” We are just happy that the force continued to tell the story about pulling over a 12,000 pound Idaho potato, and for that we thank them! 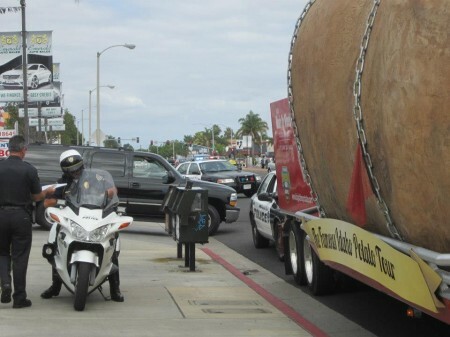 Some more backup arrives to help solve the great potato dilemma. 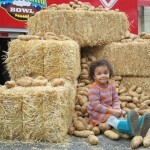 Everyone loves a good farmers market and everyone loves a good Idaho potato. 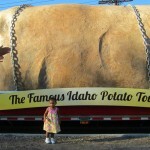 So this means that everyone should REALLY love a farmers market with a six ton Idaho potato! Well that’s just what the people of L.A. got. This past weekend was the 78th Annual Fall Festival at the Original Farmers Market in Los Angeles. We helped them celebrate by taking over the pumpkin patch area and giving the kids a more delicious piece of produce to decorate than the standard pumpkin they are used to. A local supplier provided 2,000 Idaho russets to be decorated with arts and crafts supplies. 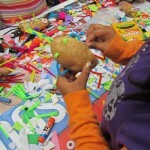 The little tots really had their creative pants on as they used pipe cleaner, googly eyes, markers and foam cutouts to create their own unique ‘potato head’. Everyone was having such a great time that even Spuddy Buddy came out to join in the fun! He was a big hit with the kids and even had one tot in particular follow him up and down the street trying to make sense of what was going on. 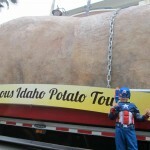 It was a busy weekend and the team was happy to report that every single Idaho potato was used. That means that about two thousand kids got to come out and participate in our arts and crafts tables while taking pictures on straw bales in front of the big spud. 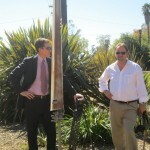 Be sure and check out our highlight reel from this event by clicking right HERE! As this amazing week came to an end, the team has realized that this coming week is the last full week of events. Soon they will be on a long drive back to Boise where they will unload for the last time. But it’s not over yet. They still have an amazing event to come this weekend in Anaheim, where they will be attending the Produce Marketing Association’s Summit. Watch for the pictures on Facebook and continue to follow and support them as they journey home on this final stretch of road. After their event at the fork in the road ended, they stopped by the gorgeous city hall for this great photo op!